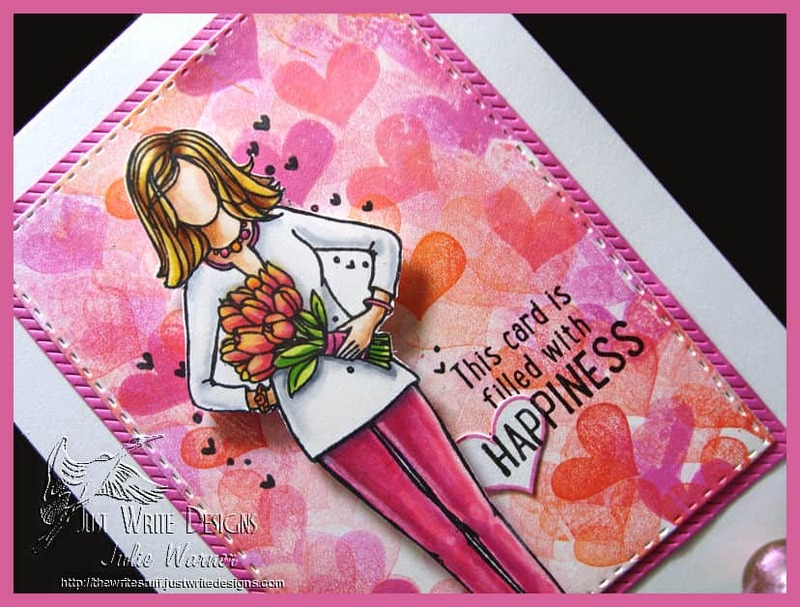 Unity & Misti Blog Hop! 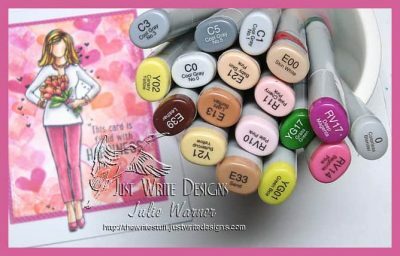 Welcome to the Misti (My Sweet Petunia) & Unity Blog Hop! Everyone who leaves a comment on all the blogs in the hop will go into a drawing for 3 prize packs from Unity and winner’s choice of an Original or Mini MISTI. Just comment by May 30th at noon Central to be eligible. 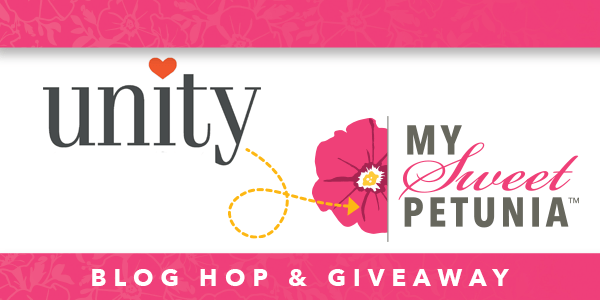 Winners will be posted on both the Unity Blog and the My Sweet Petunia blogs on May 31st. If you arrived here from Donna Baes‘ blog, you’re in the right place. Have you been totally amazed by the projects so far? There’s still more to come so please get comfy! 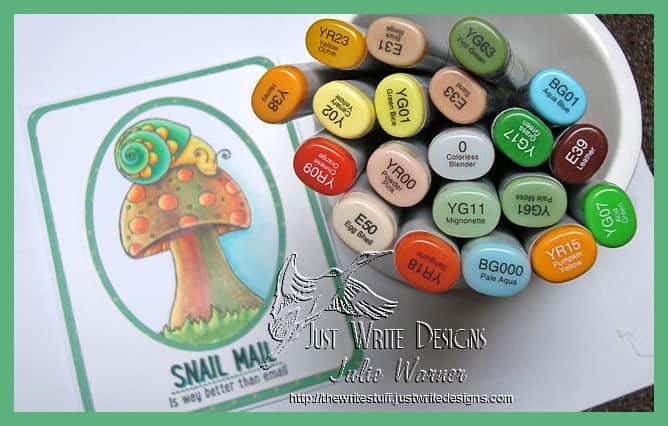 I’ve been in love with my Misti for a while now..I rarely ever stamp without it & I know I’ve barely scratched the surface of all I can do with it. And when I received these fab images from Unity, I couldn’t wait to work with them! The styles of these images are so diverse…just how I like things. My first card started with a Brusho background I made ages ago. It’s sort of how I imagine deep space would look & thought it would look good behind this happy little girl, who’s in her own little world, blissfully swinging from a star. Remember that feeling, as if you’re flying? 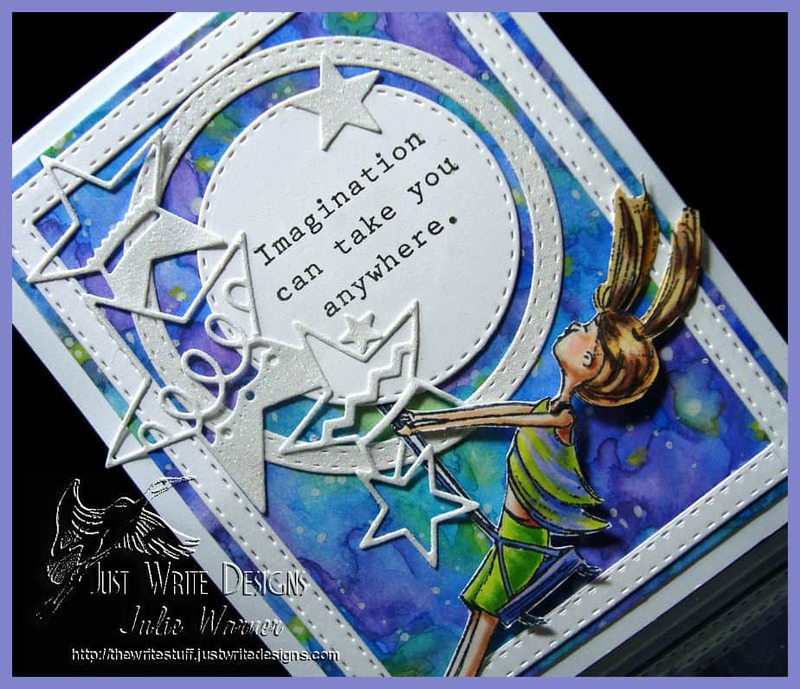 I put her in my Misti, stamped, colored her w/ Copics then overstamped her. Please check out the last card for the comparison on how big a difference this makes. 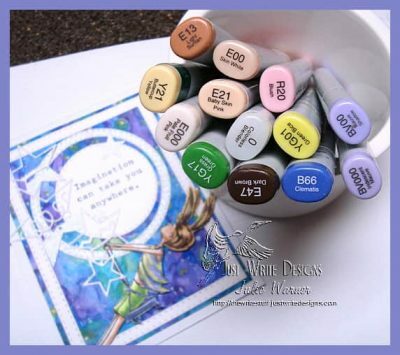 Below is the inside, using leftovers from the front & next to it are the Copics I used. Maybe this lovely lady is the little girl, all grown up, and so stylishly attired. I love all the little hearts floating around her & the bouquet of tulips she’s holding. 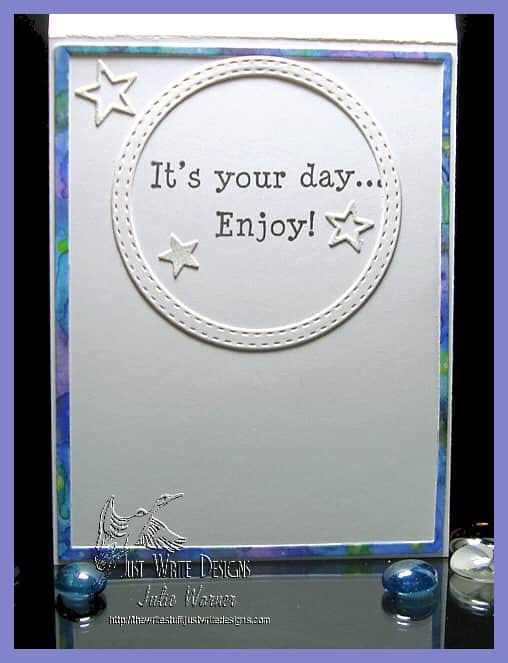 On Monday, I saw a technique challenge on Splitcoaststampers (TLC639) called “Smack Down” (click the link to check it out). So I took the solid heart image from the set and made the background using Distress inks in pinks & oranges. She was done separately, colored & fussy cut & popped up to give her a little separation from the background. 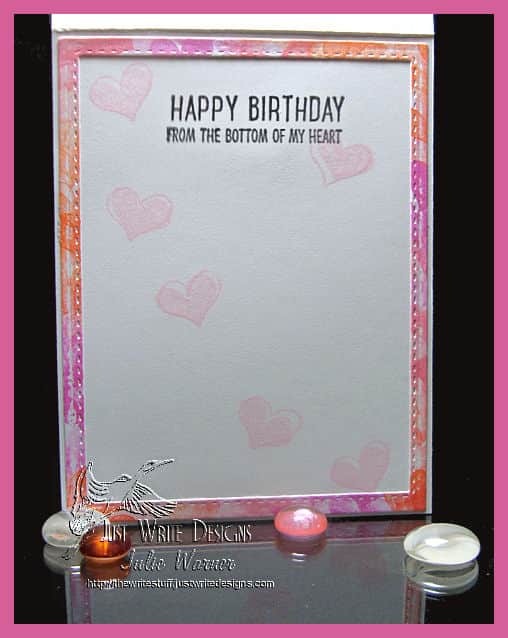 I used the Misti to line up where I wanted to put her & stamped the hearts onto the background before attaching her. 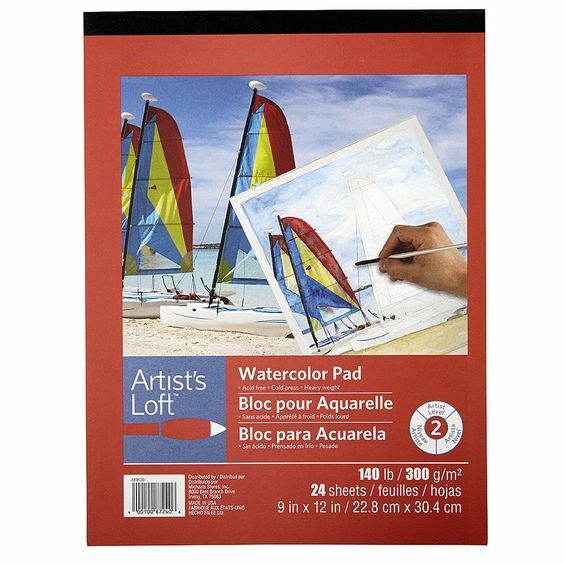 Below is the inside & Copics I used. 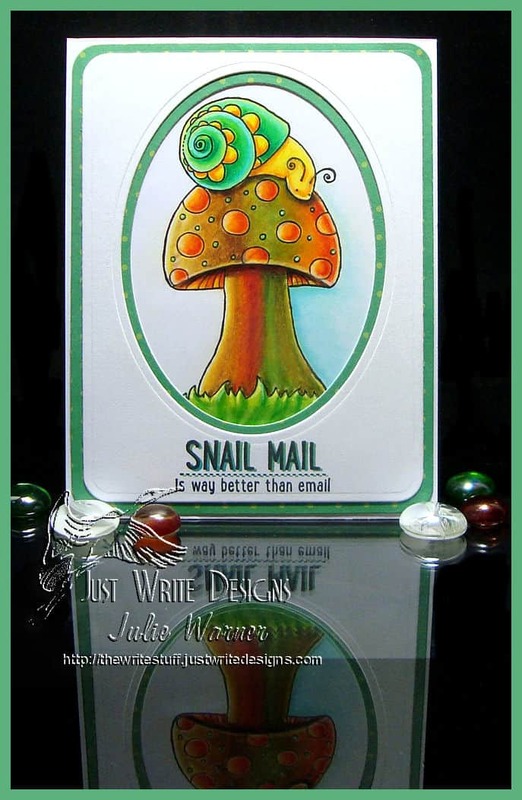 This last card, features this whimsical mushroom & adorable little snail. I love coloring mushrooms in fantastical colors but sometimes it can be hard to blend such different colors. So a lot of times I’ll color them first w/ Copics then blend over this w/ Prismacolor pencils, as I did here. It just gives the blends a softer look. Here’s what I did w/ the greeting. 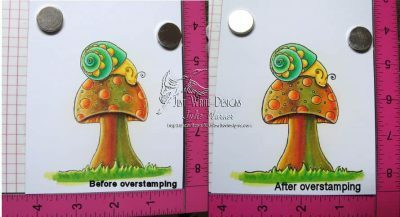 After stamping it in black, I shifted the paper up and left just a tad, cleaned off the stamp & stamped it again w/ pistachio ink, taping off the bottom half so only the top part would stamp. 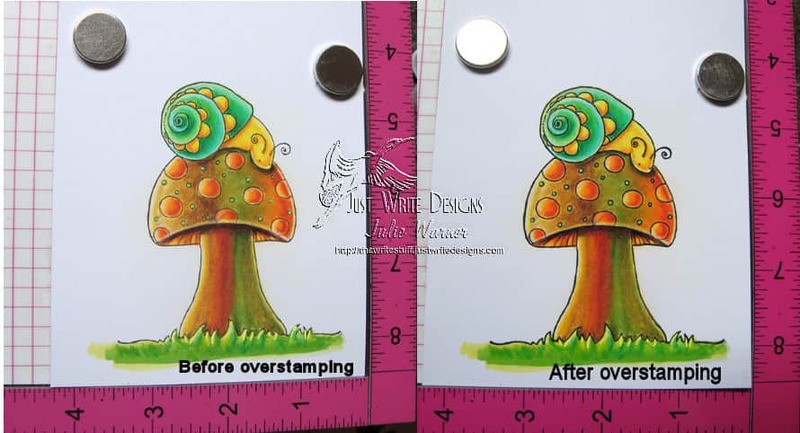 (I stamped the greeting on the plastic sheet that comes w/ a stamp-a-ma-jig to make sure it was lined up correctly, so that’s why the one on the left appears a little blurry.) 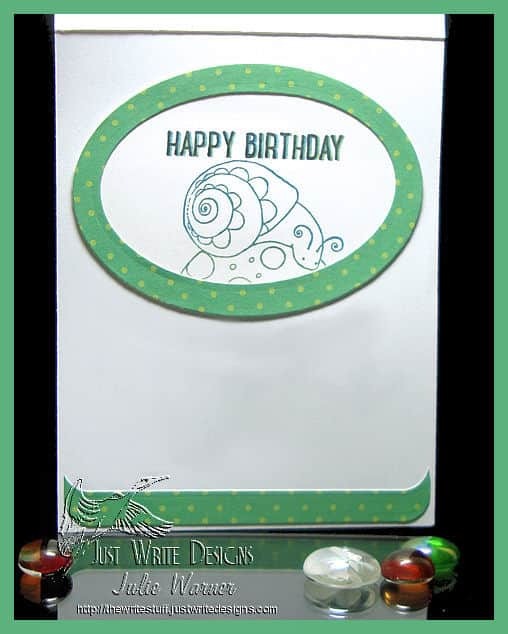 This is a great way to add a little color to a greeting.